Standing together with her son in unibrow solidarity, Eranier Davis, the mother of SEC Player of the Year, future No. 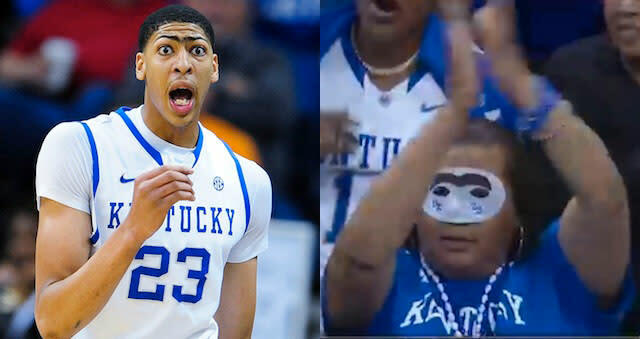 1 draft pick and Bert-lookalike Anthony Davis wore a unibrow mask to Sunday's SEC championship game in New Orleans. Mrs. Davis was seen cheering on her son, who is almost as famous for his singular eyebrow than he is for his shot-blocking prowess, from the stands in a Mardi Gras mask with a drawn-on brow. She also wore the mask to Saturday's semifinal game. It was probably hard to see through the mask, which may not have been a bad thing on Sunday. Though Davis contributed a double-double, Kentucky was upset by Vanderbilt, 71-64. It was the Wildcats' first loss SEC loss of the year and only the team's second defeat this season. 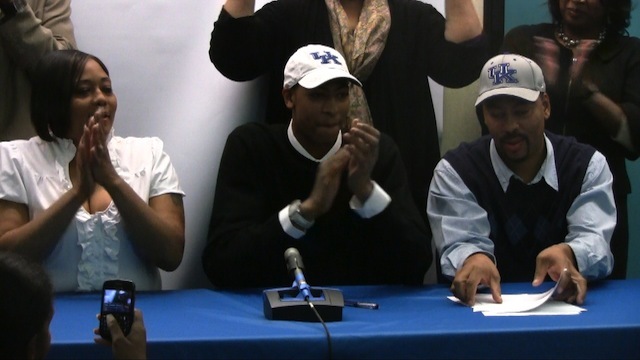 Davis and Kentucky are the top overall seed in this year's NCAA tournament. The team opens play on Thursday at 6:50 p.m. EDT against the winner of a play-in game between Mississippi Valley State and Western Kentucky.